Reservations for Jamarek may be made online at www.hprtickets.org or by calling the station (955-8821) during regular business hours. Tickets are $30 general, $25 for HPR members, and $15 for students with ID; service fees are applied to online orders. The Atherton Studio is located at Hawaiʻi Public Radio, 738 Kāheka Street. Doors open a half hour before the performance. Advance ticket purchase strongly encouraged as the house is frequently sold out before the performance date. "Jamarek," a word meaning “peace only,” is a greeting used by the Wolof people in response to the question "how are you?" It also captures the mission of this local band, many of whose members have performed around the world. 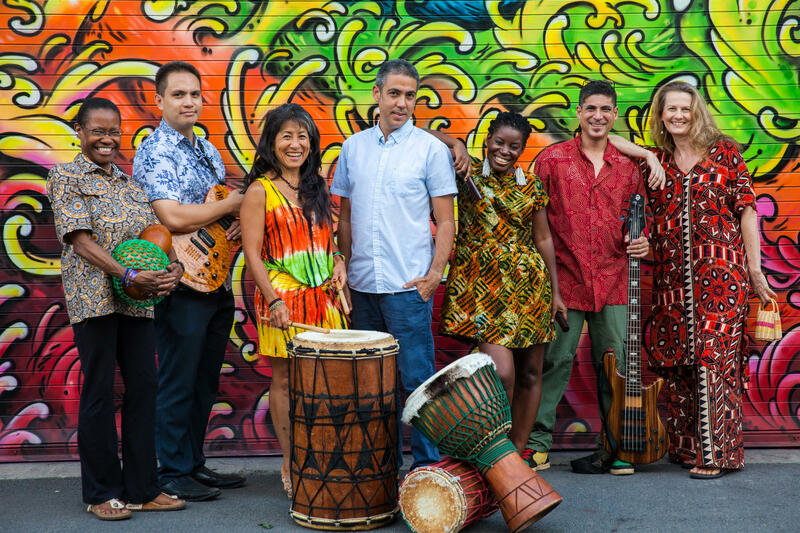 The musicians include Darryl Cabral (djembe, sabar), Kapono Ciotti (djembe, sabar), Pete Shimazaki Doktor (bass), Ikaika Hussey (guitar), Kahnma K (vocals), Lori Kimata (doun-doun, percussion), Tirrell McGruder (shekere, doun-doun, percussion), and Kirstin Pauka (doun-doun, percussion). Kapono Ciotti is one of the founding members and the current musical director of Jamarek. He started his musical career at the age of three taking drum lessons with Harold Chang. In high school, he began serious studies of world percussion with professional percussionist Michel Seguin. At 17, as a part of the group Sundrum, Ciotti opened for Carlos Santana. From there he dedicated himself to the study of West African percussion, moving to Dakar (Senegal) to study with the family of Doudou Ndiaye Rose, as well as with Vieux Sing Faye. In Dakar, he performed for the president of Senegal, and was initiated as a drummer in exorcism ceremonies, wrestling matches, circumcision ceremonies, and many other traditional events. Since then, Kapono has traveled and lived in several areas in West Africa where he maintains a second residence. Ciotti is also a leading researcher for the Guewel Tradition Project, a research project based out of Suffolk University in Boston, Massachusetts. The project documents, archives, and protects the Sabar drumming tradition - a rich and living tradition in West Africa. He has given talks on West African music in Hawaiʻi, Boston, and in West Africa. Kahnma K has been the lead vocalist in Jamarek for over seven years. She has been a part of the music industry for a long time and has worked on noteworthy projects, including the Nā Hōkū- nominated album she put out last year with her pop-reggae band Jookbox City. It is singing with Jamarek, however, that she feels most at home. "I get to lose myself and connect to the spirit of my ancestors" is how she describes what she embodies when performing with Jamarek, allowing her to perform in her native tongue, the Bassa language of Liberia, West Africa. She will take you on a memorable journey with an electrifying combination of the passion of her homeland and her smooth melodic vocals. Jamarek: Tirrel McGruder (percussion), Ikaika Hussey (guitar), Lori Kimata (percussion), Kapono Ciotti (djembe), Kahnma K (vocals), Pete Shimazaki Doktor (bass), Kirsten Pauka (percussion).